Hawaii's largest island, know as The Big Island offers beauty and relaxation for all. 4030 square miles, The Big Island is twice as large as all the other islands combined. The island owns many volcanoes, but the two largest are Manua Kea and Manua Loa. MANUA KEA is 13,796 feet tall and is the largest island-based mountain in the world. MANUA LOA is 13, 677 feet above sea level and is the largest active volcano in the world. This volcano last erupted in 1950. 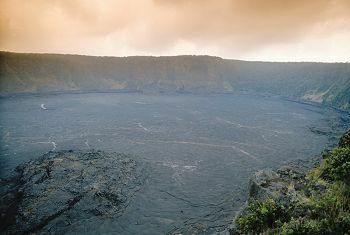 KILAUEA is a third volcano. It is one on the world's most active craters. In 1992 it destroyed the ancient Hawaiian village of Kamoamoa. The Big Island is the state's greatest producer of sugar, papayas, vegetables, anthuriums, macadamia nuts, and cattle. The island measures 93 miles long and 76 miles wide. The road around the island is 300 miles and can be driven in a day, though it is recommended that you take 5 days to drive it. In downtown Hilo you can find a collection of ethnic eateries, swap shops, and Japanese groceries. Gwen's 961-2044 This is a great place to pick up a sandwich for a low price when you are on the go. Hukilan Restaurant 935-4222 This resturante's menu offers fresh seafood along with steak and chicken meals. Lehua's Bar & Grill 935-8055 The house specialties here are the angel hair pasta, stirfried vegetables, and spinach lasagna. Hapuna Beach State Park For tours and equipment, call Jack's Diving Locker at 329-7585 or Fair Wind at 322-2788.